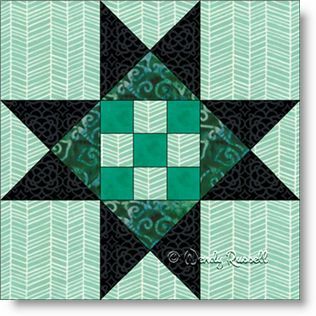 The Dolly Madison Star - Variation quilt block is based on the Ohio Star with an additional, small nine patch block for the centre. This is a simple block to construct as long as precision in taken with the sewing, particularly with the small nine patch centre. This quilt block can introduce beginner quilters to the quarter square triangle patch, which is so prevalent in many quilts. The sample quilts shown illustrate the straight set and on-point layouts. The on-point layout also features sashing to separate the quilt blocks.